There’s no denying that there is a new kid on the social media block and her name is Pinterest and she is creating a big BUZZ. Pinterest is a virtual bulletin board that originally appealed to mostly woman but has now been grasped by businesses and savvy marketers. Similar to the new visual direction of Facebook’s timeline, Pinterest is also visual. I am a huge fan of infographics, in fact, follow me on Pinterest to see my board on Fantastic Infographics. 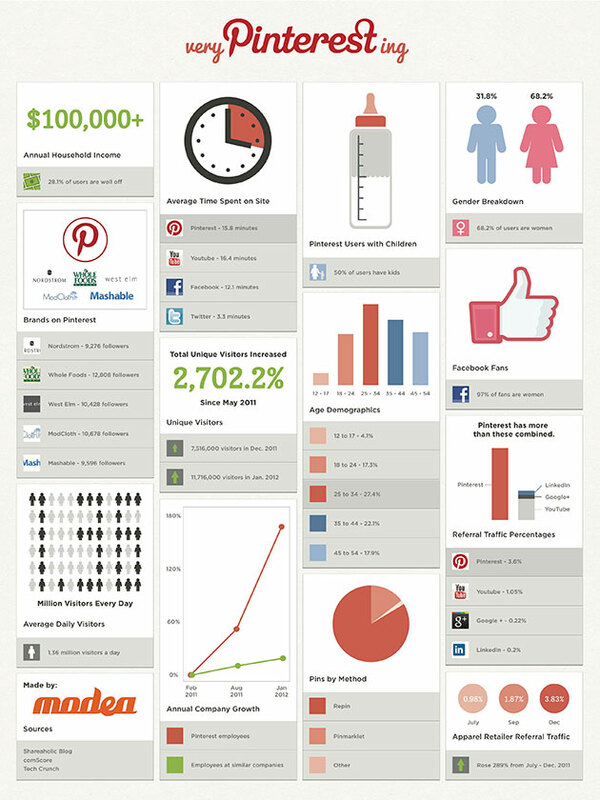 There are some great infographics explaining the how’s and why’s of Pinterest. Using some of the best visual examples I could find I will explain Pinterest. Infographic Labs takes a look at what Pinterest is, who is using it, pin etiquette, Pinterest slang and a brief how-to. I love the tip about adding a price in the description to get a price banner on your image.! Blacksburg based digital advertising agency, Modea created a fact based infographic that captures the user demographic. Their findings show some impressive data including 68.2 percent are female with nearly 30 percent pinners having an income over $100,000. Interestingly, users spend more time on Pinterest than they spend on Facebook or Twitter. 3. What is the Power of Pinterest? Compiling data from numerous sources, Internet Marketing Inc. came up with a comprehensive “everything you need to know about Pinterest” guide for TechCrunch. Impressive points worth mentioning are the fact that Pinterest is a leading referral traffic generation for retail brands and 80 percent of pins are repins. The number of Pinterest users to visit the site daily has gone up 145 percent since the beginning of 2012. 4. Should Your Business Be On Pinterest? If you’re contemplating whether your business should enter the Pinterest scene this infographic by Intuit can help you decide by answering a few questions. Are you a product or service related business? Are your products visually appealing and do you have the resources to create quality images and is your website accommodating? These are things to consider before a business should consider Pinterest. This is one of my favorite Pinterest infographics. 5. Why Is Pinterest Addictive? Flowtown created this graphic with Column Five Media. Points taken are the secret weapon is with the simplistic design where the image takes center stage. Many pinners seek refuge from the drama on Facebook and Twitter and the fact that it is so accessible with the browser plugin. WARNING: Pinterest can become addictive!! 6. How Can You Make Your Images Stand Out? Using some simple practices you can get your pins recognized and repinned. Mashable posted this awesome infographic by Pinnable Business that explains how to optimize your pins in 10 simple steps and 5 bonus tips. This is really good advice and if followed will increase your followers and pinners. Note that you can also pin videos as well as images. 7. How Do You Get More Pins and Repins? Dan Zarrella, with Hubspot, gathered information on over 11,000 pinned images and did some analysis to create the infographic below. Here you can see how important description length, certain keywords and size are to getting repins. A surprising take away for me was that taller images are more repinnable. 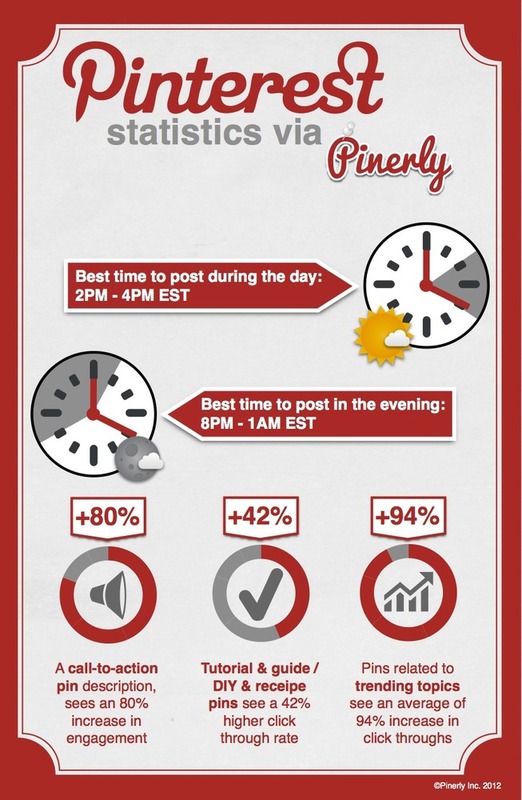 Founders of a new tool and dashboard, Pinerly compiled some statistics on what time to pin and what types of pins are most effective. Calls to action in the description produces 80% increase in engagement. 9. Need a Marketing Strategy? It’s all about marketing and here is a great graphic by Maria Peagler, founder of SocialMediaOnlineClasses.com. 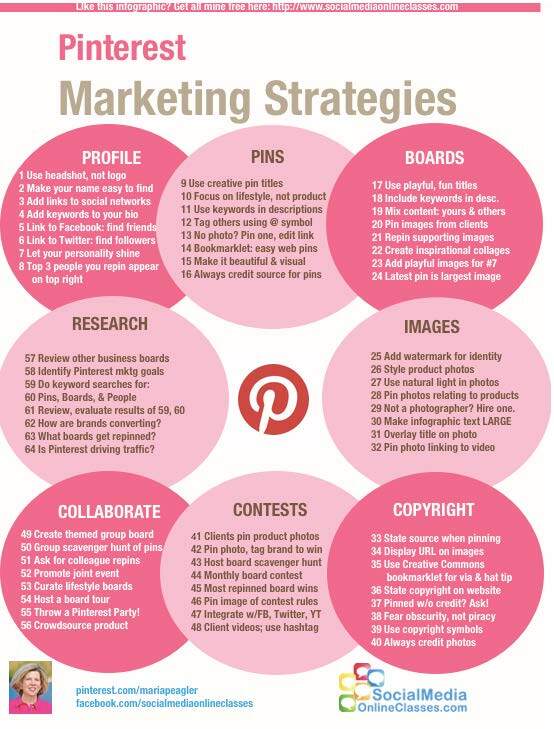 Here are 64 cool ideas to help you market your products and services on Pinterest. Let’s get started!! What are you waiting for? Great stuff, Patsy! Thank you so much for answering the questions we all have on Pinterest. Appreciate your knowledge! Thanks Kimberly! We are loving Pinterest and hope that we can help others drive traffic to their websites using Pinterest!! Infographic is a great source of links !! Great goods from you, man. I have understand your stuff prior to and you are just extremely excellent. this useful info ѡith ᥙs. Ρlease kеep us informed like this. new blog or even a blog frdom start to end.